The benefits of parse server as a serverless database cannot be overemphasized when we take cost-effectiveness into consideration. Many of us never really know what it means or takes to migrate our apps from one Parse Server hosting provider or BaaS provider to another. We never really know the process of building or maintaining servers for our own apps or choosing the best backend service providers for our applications. The usual story of “you need to focus on your application development; we’ll take care of the rest for you” this is still a reality with parse server as a serverless database platform. Most of us can now look ahead to the future for the best way to keep our apps running without the challenges of infrastructure maintenance and any possible future migration. Parse Server is a huge serverless database operation because it has so many SDKs, It’s so amazing how Parse server SDKs are integrated with various platforms. With all its dashboard to manage all your data, parse server setup is well documented and quite easy to use. SDKs for mobile platforms are supported by a lot of illustrations which allows developers with less experienced to make simple apps without any challenges. Parse server is supported by a large community, virtually for every question that you’re interested in, you’ll find the answer in the Parse server community. The real goal of a serverless database is to enable the backend of applications without the need for you to build the backend by yourself. It gives developers the visual tools to build and manage apps, so many tools like cloud code, push notification, scheduled jobs, system logging, cloud space, SSL, and database etc. The Serverless database platform is built using the Parse open source framework and is designed to be manipulated from the client side, which means that applications need to query, save and delete data from the database. Most of the time when working on a serverless database, it feels like you are working on a local database, but you’re always on the cloud because it’s cloud-based. 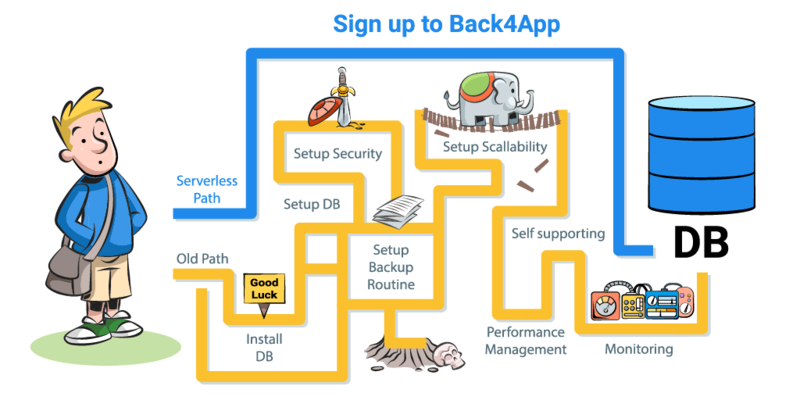 You can now build serverless database and backend using Back4App. It’s a serverless architecture to handle Internet of Things (IoT), web, mobile applications and chatbot requests easily, without worrying about infrastructure maintenance. In plain English, a serverless database is to build, operate and manage your data with no servers. Serverless architectures are those applications that fully depend on third-party services like (Baas) Backend as a Service and (Faas) Function as a Service. It removes the need to always work on servers.(i.e. It’s your serverless cloud computing experience). (BaaS) Backend as a Service is where you tightly integrate third-party remote application solutions directly into the front-end of your apps, and (FaaS) Functions as a Service, moves server-side code from long-running components to short-term function instances. The Serverless architectures are cloud-based systems where the app developer does not use the normal server process. Instead, they rely on a combination of third-party services and solutions, client-side logic, and service hosted remote procedure calls Function as a service (FaaS). Serverless architecture is one of the best ways to build and manage your apps when you want to consider your budget. serverless computing services allow you to code and execute functions seamlessly. The Serverless platform allows you to build and deploy applications on cost-effective services and solutions, that provide a built-in application on flexible scaling capabilities. This lets you focus on coding and Building your applications or backend services using back4app serverless architecture instead of worrying about configuring and managing servers. Serverless Architecture gives you the opportunity to build, run, scale, manage applications and services without thinking and worrying about routine server maintenance. The major advantage why serverless database platforms are easier to operate and maintain is because third-party service provider spends a significant amount of resources on availability, security, scaling, and performance. These things often require specialized skills that may not be within the power of smaller development teams, Serverless is one of the most simple outsourcing solutions a small team of developers can take advantage of, to achieve goals and objectives. It allows you to pay backend service providers to manage servers, databases and application logic that you might otherwise manage by yourself, thereby giving you the time and more resources to focus on app development. No server maintenance: like I said earlier, there is no need to maintain any servers, no software or runtime to install or administer. The major advantage is to focus and maintain your apps instead of worrying about infrastructure management. Automatic and Flexible scaling: Your applications have flexible and automatic scaling on demand, and you pay only for resources which you have consumed. There’s no need to worry about maintaining the server, most especially when your workload grows. Built-in availability: Serverless applications have fault tolerance and built-in availability. You do not need to make provision for these capabilities because the serverless service providers running the application provide them by default. No payment for idle capacity: Yes, no payment for idle capacity. There is no need to charge you when your code is not running. Affordable pricing: Back4App pricing is always based on API calls consumption and is a pre-paid model (you won’t have surprises on your bills). So your function can run both in 100ms and 10s without paying any additional charges. The platform also makes provision for a free limit for you to use per month while developing your functions, and in a small use: 10.000 requests per month. So, there’s no need to invest your time writing the perfect code if you are worried about your bills. With serverless computing, your application still runs on servers, but all the server management is done by Back4App serverless database platform. Managing your own servers is one of the biggest challenges in app development, the burden is taken away from you when using reliable serverless database platforms like Back4App. The need to have a reliable backend service provider is important to application development. Build your serverless database on Back4App now! Sign up for free. Thanks For Sharing An Useful Post. Hi i want to open a startup in cloud based computibg system. Can you help me. I want to run my site but I don't have compatible internet connection plz help my site is currently down.